Recent Posts » Which is the Better Option: Paid Search or Organic Search? Which is the Better Option: Paid Search or Organic Search? There’s been some debate in the SEM world over whether or not a business should run a paid search campaign if they’ve already achieved a high organic PageRank for their targeted keywords. After all, if you were already ranked on the first page of Google, why would you want to spend precious marketing dollars on paid search ads? This kind of cannibalization was a legitimate concern for advertisers. In response, Google embarked on a study in 2011 to determine just how many times a paid search ad was displayed (an impression) versus how many times the same company appeared on the first page of the organic results for the same search. In short, Google found that 89% of traffic generated by paid search ads is NOT replaced by organic clicks when your paid search campaigns are offline. In their most recent study, Google went even further and found that a paid search ad with a corresponding first page organic result actually has a higher click through rate (CTR). Assuming your SEO efforts have landed your site on the first page of Google’s organic results, anywhere from 50 – 96% of your ad clicks are actually incremental. Of course, it’s important to note the source for this data is Google, who obviously has a vested interest in driving its paid search product. Nevertheless, the data is informative and certainly revealing. So what does all this mean for you as a marketer? Well, in layman’s terms, this means that even if your page ranks well in an organic search, people are still electing to click on the paid search ad instead of the organic result. And, as an SMB attempting to maximize ROI on paid search campaigns, it means that paid search should be used in tandem with your other online marketing efforts, including your SEO efforts. The most efficient online marketing campaigns are integrated across different tactics, and paid search is an important piece of any robust online marketing strategy. In order to properly leverage your own paid search and SEO efforts and make sure that they are not cannibalizing each other, it’s important to review and monitor your campaigns frequently. 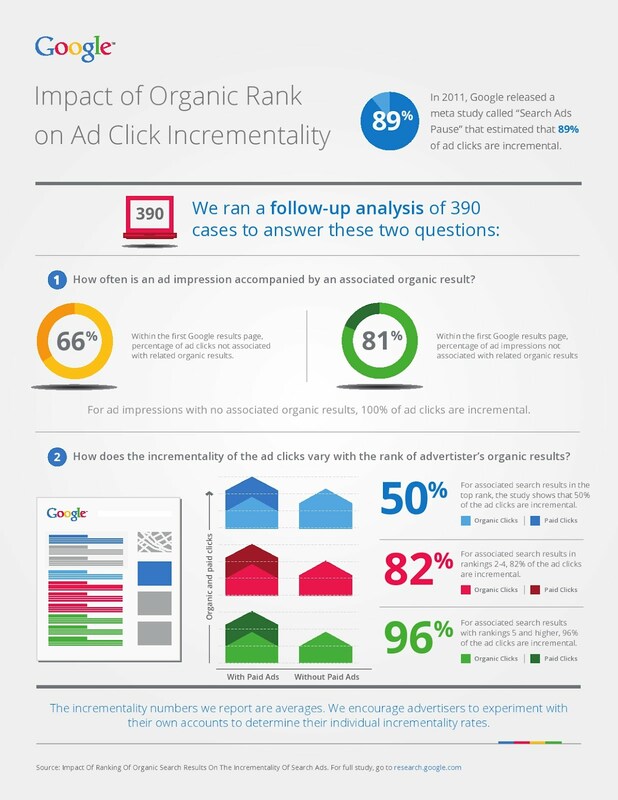 Want to learn more about organic rank and paid search? There’s a Google infographic for that. For more SEO tips and best practices, check out our free SEO Field Guide (registration required).